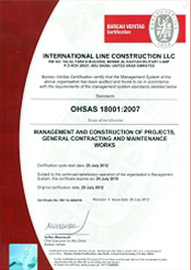 International Line has a committed OH&S policy, which comprises of in house OH&S representatives and First Aiders and takes safety very seriously, which shows in it’s unblemished record. Much of this arises from the training that International Line Constructions offers its employees not only in OH&S but all aspects of the construction industry. The construction of concrete buildings, often hundreds of feet above ground, is some of the most hazardous type work found in the construction industry today. Our number one priority every day is to ensure the safety and health of our employees. International Line’s management and employees are fully committed to provide a healthier and safer environment to all involved, the community and the surroundings in which it operates by minimizing Occupational Health & Safety risks as well as environmental impacts.